Britain and France have announced that their navies will conduct a joint freedom of navigation exercise through the South China Sea in June. This could signal a shift in their engagement towards the Indo-Pacific, with major implications for regional security dynamics and Chinese policy. The growth of China’s influence in the Indo-Pacific is undoubted. From its forceful claims in the South China Sea, to the money it has lavished on investments in countries across the region, Beijing has busied itself by steadily extending its reach. This presents a challenge to other states, and those in the West in particular, as they attempt to counter the tide. Much attention has focused on the American response to these developments, which is understandable given its status as the predominant regional force. Though Britain and France are often overlooked, there are signs that they will heighten their engagement in the Indo-Pacific, as both have the muscle and legacy to contribute to potentially challenging China. Can Brexit Britannia Rule the Waves? Dean Acheson, the U.S. Secretary of State under President Truman, famously said; “Britain has lost an Empire but has not yet found a role”. With Britain leaving the EU in March 2019, what will its new role in the world be? The U.K. government has outlined a vision for a Global Britain as its new foreign policy direction. Though the exact details remain unclear, pivoting towards the Indo-Pacific appears a strong candidate for a number of reasons. Despite years of biting budget cuts to its armed forces, investment in a major aircraft carrier program offers Britain the ability to more readily project its power “east of Suez” than at any time since the early 1970s. 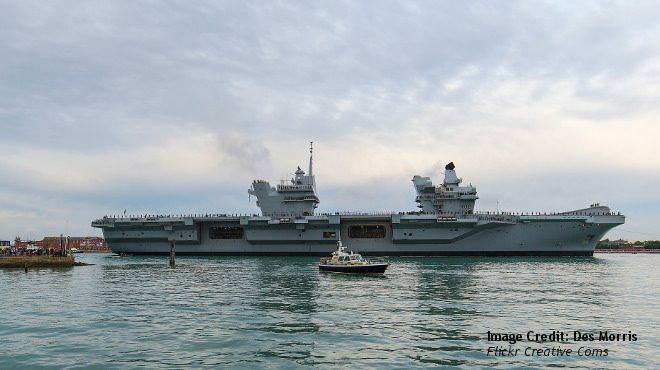 The two new supercarriers the Royal Navy will soon possess, act as giant floating air bases, allowing for significant deployments to be made far away in the Indo-Pacific. With expensive new destroyers guarding them and American-designed F-35 fighter planes to be stationed on the vessels, the British navy will command the enhanced capabilities necessary for such a strategy. Along with this new hardware, an expanding footprint of military facilities across the wider region hints at the future direction of British policy. The opening of a naval base in Bahrain, along with a facility in the Omani port of Duqm, will allow the new aircraft carriers to dock and repair. Given that India signed an agreement earlier this year for similar basing rights in Oman, a closer alignment between the strategic visions of London and Delhi also appears possible. The foreign policy of President Macron has been marked by dogged proactivity as he has sought to transform his country into a problem-solving power on the global stage. Though more often engaged in security and peace-building in its former African outposts, France has shown its wider assertiveness in trying to uphold the Iran nuclear deal and in seeking to prevent a global trade war. Both of these were triggered by President Trump, and even if they do not represent a broader American retreat, they certainly demonstrate the willingness of Paris to step in and fill the void. As France seeks to shore up the liberal world order with its newfound forcefulness, it naturally pushes against the interests of China, whose conduct raises questions for the current system. Given these challenges, France has clear potential to re-assert itself in the Indo-Pacific, especially given its military capabilities in the region. Its interests in the Indo-Pacific include a number of military bases in its overseas territories, such as Réunion and Mayotte in the Indian Ocean, and New Caledonia and French Polynesia in the Pacific. Though Macron appears willing to use French power unilaterally where he feels it advances his country’s interests, he is also a strong advocate for multilateralism, which makes coordinated action with those resisting Chinese influence in the region more likely. Though Britain and France cannot seismically alter the strategic balance in the Indo-Pacific on their own, if acting in concert with other allies in the region, they can make a powerful mark. The “Quad” military grouping of the U.S., Japan, Australia and India, recently reformed in response to a belligerent China, appears keen to entice them to engage in the region. The “strong Indo-Pacific axis” that Macron recently referred to, does not have to entail hostility towards China. Securing vital shipping lanes and upholding the rule of law, as the stated goals of the Anglo-French maritime exercise are, help to strengthen the interconnected global system. As Beijing relies so heavily on this, greater security cooperation between Britain, France and the Quad, though done in pursuit of their own interests, can also serve China’s. Uncertainty over Trump’s foreign policy, along with China’s increasingly bold assertiveness, has made its traditional allies in the Indo-Pacific nervous. In this febrile atmosphere, those across the region wary of Beijing’s rise are likely to seek deeper engagement with military powers such as Britain and France. Internal European difficulties are likely to weigh on their ambitions to participate more fully. Nonetheless, it does appear likely that the era of unipolar American dominance in the region is coming to a close. Though many had once expected China to emerge as the sole counterpart to the U.S., the maneuverings within the Anglo-French alliance and the Quad suggest the development of a more diffuse multilateral regional power dynamic. Whether the coalition of states wary of Chinese influence can organize themselves effectively remains to be seen. What does appear evident is that we will witness many more “freedom of navigation” operations by various powers in the South China Sea in the future.